No amateur has ever won The Masters. Frank STRANAHAN (USA) – 1947. A final round 68 saw Stranahan come through the field ultimately finishing 2-shots behind champion Jimmy Demeret. Ken VENTURI (USA) – 1956. A final round 80 in windy conditions saw Venturi lose a 4-shot lead and finish second by 1-shot to Jack Burke. Charlie COE (USA) – 1961. Like Stranahan Coe finished fast with a 69 and a record amateur score of -7. He ended up tied for second with Arnold Palmer with neither able to catch a faltering Gary Player (74 / -8 total). Billy Joe PATTON (USA) finished 3rd in 1954 but perhaps came closest to delivering an amateur Masters victory. A hole-in-one on the 6th in the final round put him nicely in the lead but a bogey on 12 and a double on 13, when he went for the green in two and found water, saw him slip out of a play-off with Sam Snead and Ben Hogan by 1-shot. In 1961, for the only time, three amateurs finished in the Top 15 – Charlie COE (USA, T2), Jack NICKLAUS (USA, T7) and Robert W. GARDNER (USA, T11). The last Top 10 finish by an amateur was Charlie COE’s T9 in 1962. Charlie COE (USA) holds most of the Amateur records at Augusta, including Most Low Amateur Honours (6 in 1949-51-59-61-62-70), Best Finish (T2), Top 10s (3), Most Cuts Made (8), Most Starts (19), Most Rounds Played (67) and Rounds At Par or Better (22). In more recent times the best amateur finish has been Tied 13th – Casey WITTENBERG (USA, 2004) and Ryan MOORE (USA, 2005) both achieved this result. Other notable recent finishes include Matt KUCHER‘s (USA) and Bryson DECHAMBEAU‘s (USA) tied 21st results in 1998 and 2017 respectively. The reigning U.S. Mid-Amateur champion was first invited to compete at The Masters in 1989. In 2017 Stewart HAGESTAD (USA) became the first and to date only recipient of this invite to make the cut. His opening rounds of 74 and 73 (+3) saw him comfortably qualify for the weekend in tied 19th position. Hagestad went on to secure low amateur honours finishing tied 36th on +6. Other mid-amateurs (over 25) had previously made the cut at The Masters – Jim HOLTGRIEVE and Jay SIGEL in 1982 and 1988 respectively – but neither were playing at that time on the official Mid-Amateur champion’s exemption. Many former amateur competitors have gone on to win The Masters as pros; these include Jack NICKLAUS (6), Tom WATSON (2), Tiger WOODS (4), Jose Maria OLAZABAL (2), Phil MICKELSON (3), Ben CRENSHAW (2) and Cary MIDDLECOFF, Charles COODY, Tommy AARON, Craig STADLER, Mark O’MEARA, Trevor IMMELMAN and Sergio GARCIA with one each. From this group six low amateur Silver Cup winners have completed a memorable double by going on to win The Masters. These are Cary MIDDLECOFF, Jack NICKLAUS, Ben CRENSHAW, Tiger WOODS, Phil MICKELSON and Sergio GARCIA. Amateur Ross SOMERVILLE (USA) recorded the first hole-in-one at the Masters. Charles KUNKLE JR’s 95 is the highest official 18-hole score ever recorded at The Masters. Marvin WARD (1940 Rd 2), Billy Joe PATTON (1954 Rds 1 &4), Ken VENTURI (1956 Rd 1), Ben CRENSHAW (1973 Rd 2), Matt KUCHAR (1998 Rd 3), James DRISCOLL (2001 Rd 1). Casey WITTENBERG (2004 Rd 1), Romain LANGASQUE (2016 Rd 4). Sir Michael BONALLACK (England) was the first GB&I amateur to compete in The Masters in 1965. Some amateurs were invited before this but the tournament wasn’t what it is today and therefore they declined, finding it hard to justify the expense. Joe CARR (Ireland) was the first GB&I Amateur to make the cut at The Masters. Rounds of 75, 73, 80 and 78 saw him finish 52nd in 1967. There was no cut until 1957. Peter MCEVOY (England) is the last GB&I Amateur to make the cut at The Masters. Rounds of 73, 75, 77 and 77 helped him to a 53rd place finish in 1977. Michael HOEY (Northern Ireland) and Matthew FITZPATRICK (England) have come closest to equalling McEvoy’s record. Both missed the cut by 1-shot, respectively in 2001 (75, 73) and 2013 (76, 73). The lowest round shot by a GB&I Amateur at The Masters is an even par 72 – Gary WOLSTENHOLME (England, Rd 1 1992) and Warren BLADON (England, Rd 2 1997). In the modern qualification era only two GB&I players have played in the same Masters. This was in 2013 when Garrick PORTEOUS (England) and Matt FITZPATRICK (England) competed, as the reigning British and U.S. Amateur champions respectively. Previously Sir Michael BONALLACK and Joe CARR were both invited to play in the 1968 Masters. The Masters has been played 83 times between 1934 and 2019, a few years being missed due to World War II. In all but 12 of these an Amateur has completed all four rounds. However, making the cut as an amateur is getting harder – 5 times over the last 14 years no amateur has made the cut. The Low Amateur prize has been won by a Non-American only 7 times. Manny ZERMAN (South Africa), who finished 59th on +6 was the first to achieve this feat in 1992. Sergio GARCIA (Spain) and Matteo MANASSERO (Italy) have both won the Silver Cup. Garcia finished T38 (72, 75, 75, 73) in 1998 and Manassero T36 (71, 76, 73, 72) in 2009. Romain LANGASQUE (France) made the cut in 2016 and in Rd. 4 shot 68, setting a new low score record for European amateurs. However, Romain (+10) was beaten to the Silver Cup by Bryson DECHAMBEAU (USA) +5. Prior to this Matteo MANASSERO had been the only European amateur to break par in The Masters. He had a 71 in Rd 1 in 2009. Tianlang GUAN (China) became the youngest player to participate in The Masters in 2013 – he was 14 years, 5 months and 17 days old. Guan went on to surprise the world by making the cut with opening rounds of 73 and 75 and by Sunday earning Low Amateur honours. Throughout the event he recorded no double-bogeys and had no three-putts. With regard to all Majors Young Tom MORRIS is the youngest ever champion – he was 14 years, 4 months and 25 days old when he played in the 1865 Open Championship. Matteo MANASSERO (Italy) was the previous youngest Masters player when he competed in 2010 aged 16 years, 11 months and 23 days old. Paul CHAPLET (Costa Rica), the Latin America Amateur champion and aged just 16, become the second youngest competitor in 2016. The oldest amateur to play in the Masters was Chick EVANS (USA) who was 62 when he teed it up in 1953. 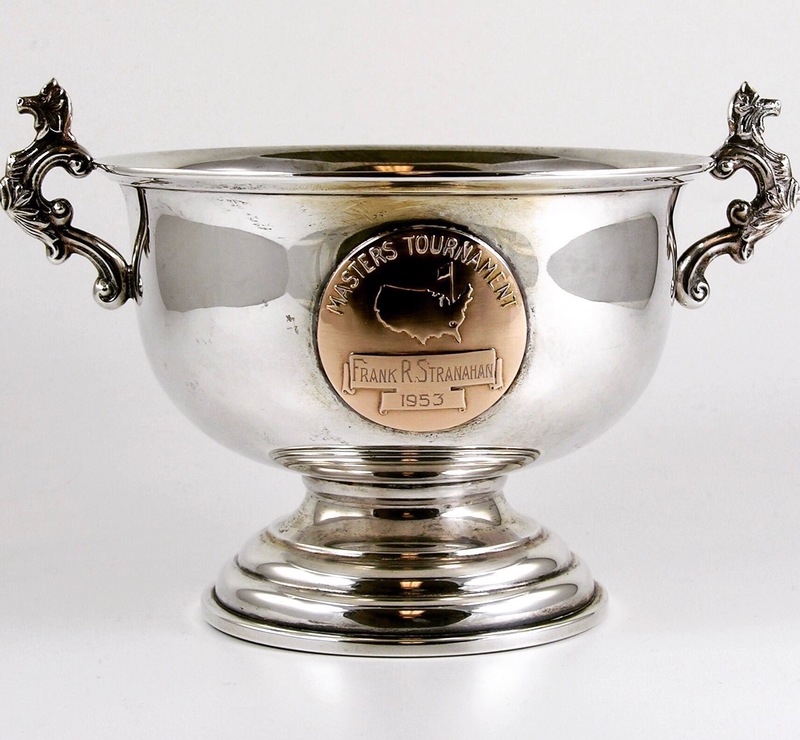 The Low Amateur began receiving the Silver Cup in 1952. The Low Amateur also attends both the television and patron prize presentations. A Silver Medal has been presented to the amateur runner-up since 1954. The Silver Cup and Medal prizes are only awarded if players make the cut and complete all four rounds. In 1956 Amateur Ken VENTURI (USA) set the record for the Most Awards in a Single Masters – 7. He took home a silver medal for finishing overall second, the silver cup and a gold medal for being the Low Amateur, two crystal vases for leading after the first and second rounds, and two pairs of highball glasses for his eagle on the 13th in Round 1 and at the 8th in Round 2. 2019 – Victor HOVLAND (NOR) finished tied 32nd on 285 (-3), just 10 strokes behind winner Tiger Woods. 2018 – Doug GHIM (USA) finished tied 50th on 296 (+2). As the only amateur to make the cut Doug secured the Silver Cup on the Friday night. The Masters Par 3 Contest has been won by an Amateur twice; in 1961 by Deane BEMAN and in 1964 by Labron HARRIS JR. Amateurs have won the Crystal Pitcher prizes, awarded for the nearest the pin on each hole, on many of the Par 3 Contest holes. In 2016 16 year old Amateur Paul CHAPLET (Costa Rica) finished tied 4th in the Par 3 Contest. Including the 2019 Masters 432 different amateurs will have competed in the Tournament during it’s history. 11 amateurs competed in the first Masters, in 1934, along with 50 professionals. The Most Amateurs in the Field record was set in 1966 when 26 competed. The Fewest Amateurs in Field record was set in 1942 when just 2 competed. Bobby JONES (USA), the amateur co-founder of the Masters played in the first 12 tournaments between 1934-48. His best finish was 13th in 1934. Amateurs are given courtesy of the Club and course as soon as they have qualified for the Masters. Many visit and play Augusta on numerous occasions before Tournament week. Dating right back to the start of The Masters in 1934 all of the amateur entrants have been invited, for a nominal fee, to stay in ‘The Crow’s Nest’. The Crow’s Nest is a communal accommodation that can sleep up to 5 set in the eaves of the Augusta National clubhouse. The Amateurs are the only competitors allowed to lodge on the grounds during Tournament week. Since 1948 an Amateur Dinner has been held in the clubhouse to honour that year’s amateur contestants. Originally suggested by Charlie Yates this Dinner actually started four years before the now far better known Masters Club (‘Champions’) Dinner. Bobby Jones attended his last Amateur Dinner in 1968 three years before he died. Since 1994 the Amateur Dinner invitation list has been widened amongst the Club’s membership. Guest speakers, including Sir Michael Bonallack and Mark O’Meara, have addressed the select group of amateurs in attendance. In 2001 the Amateur Dinner was moved from the Wednesday night of Masters week to the Monday night. The Amateur dinner has become an interactive experience in recent years with a video of each player being shown before each of them is invited to introduce themselves to the invited guests. From 1959 the Masters Competition Committee started to look after the amateurs in the actual draw, pairing them with former champions, star players and if possible fellow countrymen. Nowadays the U.S. Amateur champion always plays with the reigning Masters champion in the opening two rounds. Bryson DECHAMBEAU lived up to his star billing and won the Silver Cup. Rounds of 72, 72, 77 and 72 saw him finish on +5 and a creditable Tied 22nd. France’s Romain LANGASQUE shot the lowest ever round by a European Amateur in Rd 4 – his 68, followed rounds of 74, 73, and 83. He finished on +10 for Tied 42nd. As the only other amateur to make the cut he won the Silver Medal. Derek BARD (76, 77), Sammy SCHMITZ (81, 75), Cheng JIN (79, 78) and Paul CHAPLET (83, 82) all missed the cut. There will be six amateurs competing at this week’s Masters. The 2016 intake will take the total number of amateurs who have competed in the tournament to 415. Bryson DECHAMBEAU (United States) won the 2015 U.S. Amateur at Olympia Fields C.C. last August. DeChambeau was just the fifth golfer in history to win the Individual title at the NCAA Division I Championship and follow it up with the U.S. Amateur Championship a few months later. He has made a big noise in golf since becoming U.S. Amateur champion and it will be interesting to see how he goes at the Masters. He plans to turn pro at the RBC Heritage Classic at Hilton Head the week immediately after his Augusta experience. Current Amateur Rankings – SPWAR 1 / WAGR 3. Derek BARD (United States) lost the U.S. Amateur final 7&6 to DeChambeau but gained the consolation of an invitation to The Masters. Bard is a Junior at the University of Virginia. He has won once this season at the U.S. Collegiate in October and more recently has had two Top 5’s in March; at the Palmetto Invite (71-65-71, -3 5th) and the Linger Longer Invitational (68-71-71, -6 4th). Current Amateur Rankings – SPWAR 13 / WAGR 25. Romain LANGASQUE (France) won the 2015 Amateur Championship at Carnoustie last June. The 20 year old Amateur champion seems to be going from strength to strength in recent weeks winning the Spanish Amateur, coming second at the Barclays Kenya Open on the European Challenge tour and then earlier this week defeating DeChambeau 4&3 in The Georgia Cup challenge match. He also plans to turn pro straight after the Masters – few would doubt he is ready. Current Amateur Rankings – SPWAR 5 / WAGR 7. 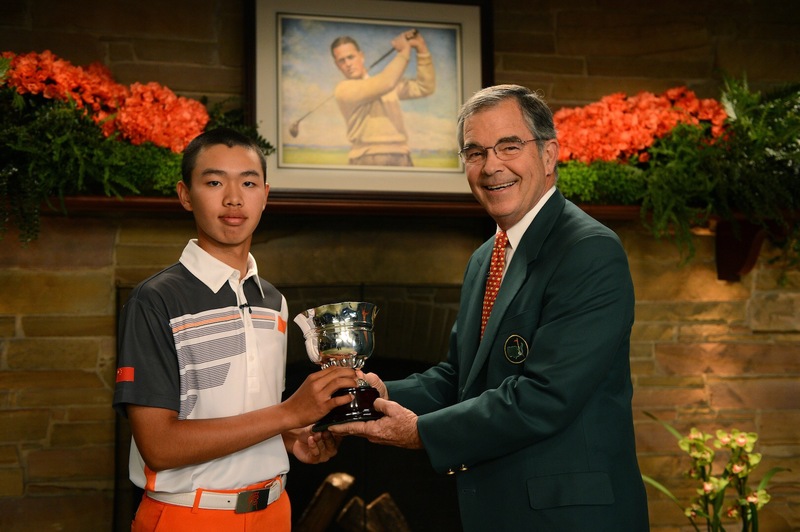 Cheng JIN (China) won the 2015 Asia-Pacific at the Clearwater Bay G.&C.C. in Hong Kong last October. A first round 62 (-8) set him up for a famous victory. Jin was 18 on 6th March but has been making a name for himself for a few years now. He won a PGA Tour China pro tournament in 2014 and has impressed when given invitations to play in both Asia and European Tour events in recent months. He will become the second Chinese player to compete in The Masters and no one would be surprised to see him making the cut like Tianlang Guan did back in 2013. Current Amateur Rankings – SPWAR 16 / WAGR19. Paul CHAPLET (Costa Rica) won the 2016 Latin America Amateur in January at the Casa de Campo Resort in the Dominicon Republic. Despite winning the Costa Rican National Junior Championship in both 2014 and 2015 16 year old Chaplet was something of a surprise winner of the 2016 Latin American Amateur. The second youngest player in the field he was ranked 834th in the World Amateur Golf Ranking at the start of play in January. He will easily be the youngest player at this year’s Masters. Current Amateur Rankings – SPWAR 380 / WAGR 441. Matias Dominguez (Chile) won the inaugural Latin America Amateur at Pilar G.C. in Argentina, thus gaining entry to the 2015 Masters. Sammy SCHMITZ (United States) won the U.S. Mid-Amateur (over 25’s) at John’s Ireland Club in Florida last October. A hole-in-one on a par 4 normally gets the job done. It certainly did for Schmitz (35) on the final hole of last year’s championship. Schmitz was a 3-time All-American at St. John’s University before moving to Florida to pursue his pro ambitions. It didnt work out so he regained his amateur status and now works in the healthcare industry back home in River Falls, Minnesota. Current Amateur Rankings – SPWAR 509 / WAGR 2,535. Last year none of the 7 amateurs who competed made the cut so no one has taken advantage of a return trip. No amateurs were able to take advantage of this exemption criteria last year although at The Open Championship at St. Andrews they were queuing up to try. The low amateur at the 2015 U.S. Open was Brian Campbell (United States) +5 T27. The low amateur at the Open Championship was Jordan Niebrugge (United States) -11 T6. Oliver Schniederjans (United States) and Ashley Chesters (England) -9 T12 as well as Paul Dunne (Ireland) -6 T30 were also noteworthy. No amateurs compete in the U.S. P.G.A. Championship. Prior to this year the Current U.S. Public Links champion also earned a berth. The U.S.G.A. decided to discontinue the Championship in 2015 and as a result Byron Meth was the last player to gain an exemption via this route. * Honorary, non-competing after one year invitations are awarded to the U.S. Amateur and British Amateur champions. In other words they are invited to play in the tournament the following year after their Amateur victory (so long as they remain amateurs) but then are also invited annually to attend the tournament as guests of the Club. Who Will Win The 2015 Masters ? UPDATE – Jordan Spieth won the 2015 US Masters with a record equalling -18 score (64, 66, 70, 70 = 270), beating Phil Mickelson and Justin Rose by 4-shots. As we all know predicting the winner of a golf tournament is far from easy. However, with The Masters our chances are better than normal – that’s because it is a Major, it is played on the same course every year and most importantly it has the smallest field of any of these four elite events. Firstly, let’s get ourselves in the mood by putting Don Cherry’s ‘Augusta’ on repeat play. In 2015 there are a few more players at Augusta National than normal, with a total of 99 qualifying for the famous early season Invitational. The broad rules for determining the winner are well known – so here is my interpretation of them. I like to deduce the winner by visually removing the Green Jacket from individual players one-by-one. 1. Amateurs and Special Invitees are there for historic reasons only. 2. Rookie’s don’t win – on average winner’s are playing at Augusta for the 7th time. 3. Former Major / Past Champions that are clearly well past their best can be discounted. 4. Over 40s can’t cope with the length and short-game demands now placed upon them. The average age of a winner is around 33. 5. ‘In The Hole’ and ‘Mashed Potato’ – those with limited or no experience of playing in the US normally struggle. 6. It is unlikely that a player will win the Masters without having competed well in a Major before. Ask yourself if they have a Top 10 finish in a Major on their record ? 7. ‘Horses for Courses’ – Augusta simply doesn’t suit some players. What does their track record and TV interviews tell us ? 8. Did they play last year and if so how did they get on ? Recent good memories must help. 9. Is their putting and chipping really up to it ? 10. ‘Bottle’ – have they shown the mental fortitude required to win a Major, let alone the historic Masters ? Take your pick from these seven who I believe should all achieve high finishes. As no European has won for 15 years (McIlroy, Poulter and Rose), Oothuizen hasn’t shown enough recent form, Spieth has contended twice in the last two weeks thus peaking too soon and as defending Majors is extremely difficult (Watson) I think I’ll go for Jimmy Walker. An encouraging Masters debut last year (T8), experience contending in other recent Majors, American, a good age (36) and maintaining great form over an extended period. Hopefully a little bit of value too.